Most people would be surprised to find that your kitchen is full of secret beauty ingredients that are simple to use, 100% natural and any day better than the over the counter versions. You can grab the basic ingredient from your kitchen and use it in a completely new way and feed your skin with healthy ingredients, vitamins and antioxidants your skin needs and thrives on. Here are some of the best natural alternatives to your current skin care products. Eggs are high in protein and work great for smoothing hair cuticles! Whip 2 eggs and add two teaspoons of olive oil to it. You can whip it in a blender to completely emulsify the oil. Apply this mixture to your damp hair, wrap it in a towel and leave it for minimum 20 minutes. Shampoo your hair thoroughly after applying it to banish the pungent smell of the eggs. Apply this high protein mask every week to repair damaged hair and to naturally condition your hair. This mask will add softness and shine to hair with regular usage. Avocado is a nutritious food which not only provides a host of health benefits, but also does wonders for your skin. It is loaded with beneficial oils and vitamins which can improve the overall health of the skin. By simply rubbing mashed avocado on the face will provide your skin with nutrients and improve the texture of the skin by reducing dryness. Mix chopped avocados with a little water and blend it in a blender to form smooth paste like consistency and apply it on the face. Avocadoes can also be used for puffy eyes just by placing thin slices of avocados under the eyes. To soften hands, blend a half avocado with two teaspoons of lemon juice and one egg white. Apply this paste on your hands and let it sit for 25 minutes to penetrate deep into the skin. 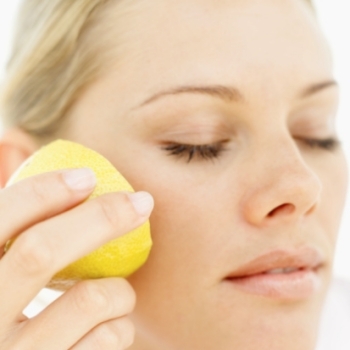 Lemons are a great skin exfoliant and is even proven to diminish spots and acne marks. It's also a natural bleaching agent, which acts like a mild bleach to lighten the skin and breaks down rough patches to reveal silky and smooth skin. Mix 2 teaspoons of lime juice with half a teaspoon of sugar and gently scrub your face to lighten the affected area. If you have an oily skin, then apply it all over the face and let it sit for 10 minutes. Wash it off with lukewarm water and follow up with a good moisturizer. Try Josie Maran's Organic Argan oil which hydrates skin and balances oils giving skin a healthy glow! You can also use argan oil as a hair and all over body moisturizer. Mix equal quantities of lemon juice and honey and apply it all over the face. Leave it for a minimum of 15 minutes. This will remove the tan and will lighten the skin tone. Lemon juice can also be used to remove dandruff. Add 2 teaspoons of olive oil to 1 tablespoon lemon juice and massage your hair with it. Leave it for 20 to 30 minutes and then wash it off. Make sure to use freshly squeezed lemons and not canned lemon juice as it contains preservative. Food and drinks often stain our teeth, keeping us from sparkly white teeth. Now you don’t need to visit your dentist to get an expensive teeth whitening treatment done, as a cost effective teeth whitening treatment can be done at home. Brush your teeth with a baking soda and water paste once a week gently for three minutes, rinse and repeat and witness pearly white teeth. You can also rub baking powder all over the body while showering to get silky smooth skin and to remove blackheads. Coconut oil is a natural beauty essential every woman should have on hand. It deeply moisturizes ultra-dry skin and even works to soothe eczema and many other skin conditions. It's an excellent hair conditioner and promotes hair growth. It can be used as a makeup remover and even works well on cuts and bruises because of its anti-bacterial and anti-fungal properties. Massaging a few drop of coconut oil on the lips will reduce lip pigmentation and will give you soft and smooth lips. As a leave in conditioning and smoothing treatment, rub a small dab of Organic Virgin Coconut oil into the ends of your hair wet or dry and brush through for gorgeous, shiny and conditioned hair! These naturally savvy skincare ingredients will not only save you money on skincare but also re-assure you that whatever you are applying on your face and hair is 100% safe and natural. Do you have a natural skincare method you'd like to include? Leave me a comment in the comments section below. Give these natural beauty ingredients and treatments a try and let me know what you think! Great stuff! I have tried them all besides lemon. Do you think that lime would work the same? My superheroes are avocado and extra virgin coconut oil.